The past week has been a blur, owing in large part to the worst bout of flu that I’ve ever experienced as well as the news that I’d been nominated for a Nebula Award for my novella, Barry’s Deal. The mix has been chaotic, but fortunately for me, EATING AUTHORS is here to provide a touchstone and keep me on track. 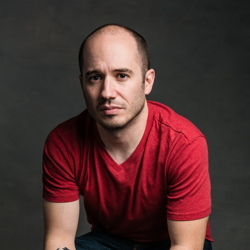 And so, with no more segue than that, let me introduce you to this week’s guest, Michael Moreci. 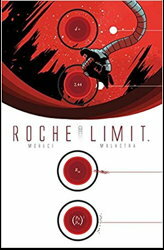 If you read comics, you’re probably already familiar with his work on a range of DC titles from Superman to Green Lantern, Wonder Woman to the Flash, as well as his own original and compelling series like Roche Limit and Burning Fields. And really, I’ve barely scratched the surface of his comics work. 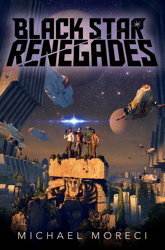 Michael’s debut novel, Black Star Renegades, was released on January 2nd from St. Martin’s Press. It’s the tale of a guy with the weight of the galaxy on his shoulders and the “ultimate weapon” in his hand. Add in an evil empire, a few creatures, some exotic locations, and a cast of misfits, and you know you’re going to have a good time. 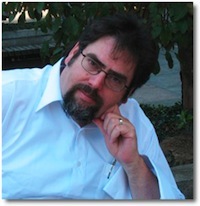 LMS: Welcome, Michael. What stands out for you as your most memorable meal? MM: You know what’s funny? When I think about my most memorable meal, I honestly can’t recall what, exactly, I ate. Which sounds…weird. But when I think the best things in life — the things I’ve experienced — they’re about the comprehensive encounter, and that’s what I’m thinking when I consider my best meal. It wasn’t just the food, but everything that went into it. My wife and I got married ten years ago, and for our honeymoon we decided to travel to Montreal–Canada being the only foreign trip we could afford — by way of Burlington, Vermont. It was just a one-night stayover, but it was a memorable one. Because of, you guessed it, the food! We went into Burlington knowing nothing about the city or the area. Neither of us had been there, neither of us knew a thing. All the wedding planning dominated our lives, so when it came to thinking beyond the big day, we had no focus. So, we went into Burlington with a few hours to burn and not a single thing in mind to do. We stayed at a bed and breakfast, and the kind woman who ran it offered us some advice: Eat dinner at a farm to table restaurant that was only a thirty minute drive away. Now, we come from Chicago, and this was around the time where farm to table restaurants were kind of the rage. Plus, my wife is a chef, so we’re spoiled with the latest and greatest in culinary pretty regularly. With that in mind, while we were excited to try out the place we’d been directed to, we weren’t over the moon. Again, we were spoiled. I fully admit it. But then we arrived at the location — which was an actual farm, and my mind was blown. I mean, here’s the thing: I was born in raised in Chicago, and my family — who had limited income — didn’t travel. Which means I was never exposed to much nature. Like, ever. Hand in hand with that is gazing up, say, on a camping trip and seeing stars. I never did that. I looked up at the sky over my house on the South Side and saw the haze left behind by the planes flying in and out of Midway Airport. Stars? Those were for country folk. Driving up to this farm in Vermont, I saw, for the first time in my life stars. A sky full of them, shining right above my head. I’d never seen anything like it in my entire life, and it was transcendent. Beautiful. Awe-inspiring. And that was just the start of the dining experience at this restaurant, which only got better and better. It’s weird, because like I said before, I don’t recall what I ate — not exactly. I believe the dish was beef-centric, of some kind? What mattered then and what especially matters now is the feeling the entire experience elicited. I don’t believe, until this point, that I’d ever eaten in farmhouse. And I’d certainly never eaten on the property of an isolated farm. As I look back on it all, I remember it being so peaceful. And I know — I know — I sound like a city slicker and all that. But being at this place, being wrapped up in stars like I’d never seen before, having just been married to the love of my life, it made the meal the most memorable of my life. And while I don’t remember the food, not specifically, I remember being brought course after course and being dazzled by each one. By the end I was completely full, utterly satisfied, and I was about to embark on the greatest journey of my life — the journey of being married to the best person I know. because I too was born on Chicago’s south side, married a chef, and count a nearby farmhouse restaurant as one of my best dining experiences. Go figure. This entry was posted on Monday, February 26th, 2018 at 7:30 am	and is filed under Plugs. You can follow any comments to this entry through the RSS 2.0 feed. You can leave a response, or trackback from your own site.